Come aboard Odyssey and experience the daily life of scientists and crew. "Today's log is the personal stories of the 3 crewmembers who have stuck with the Odyssey through all the hard times and today celebrate not only 5 years of the Voyage of the Odyssey, but 5 years of their own personal voyages around the world." "G'day - my name is Adrian Howard, people call me 'Howie'. When at home in Australia, I work for the Melbourne Zoo as a zookeeper, specializing in Asian Elephants and Australian Fur Seals. I also have keen interest in learning more about marine mammals and their ocean environment - an interest which brought me to volunteer my time on the Odyssey." "The secrets of the riches of our seas were initially unravelled during the Tulip expedition of the early 80's. The Odyssey is only the second research team to do a comprehensive study on the marine mammals of our waters and I am proud to be a part of the team." "Christmas this year for the Odyssey crew is being spent almost 600 miles from the nearest port, where half of the view is sky, the other half ocean. As we are travelling to the Maldives, we are reminded once again that the open sea can be overwhelming. It is a world traditionally alien to us bipeds, and here we are the visitors rather than the residents." "I was thrilled to see humpback whales in the Seychelles. Hearing the whale singing live underneath the boat and spotting the blow of the tiny calf next to its mother was incredible. Even last night we heard the faint sound of a humpback whale on the acoustic array, the underwater microphone we tow behind the Odyssey." "Most of us have probably stood on the deck of a ship or some barren shoreline and thought about sending a message in a bottle across the sea. In some cases fortunes were made, marriage proposals answered, and rescues initiated. Although most of us probably didn't act on this impulse, a few of the ones who did were later pleased that they had done so." "Over the last couple of weeks, we have been experiencing a sizable swell that is not at all unusual for this time of the year in Western Australian waters. Unfortunately for several of the crew, this has meant succumbing to a condition that is the dread of any mariner - seasickness." "Coming from Germany and still trying to improve my English, it was quite a challenge to learn just the basic boat terms, especially considering our international crew. When I first got on the boat I had to learn a completely new language. " "I have now been at sea for two weeks and have certainly come to grips with the rigors of offshore cooking. Whilst underway I also participate in helm and observation watches. This keeps almost every hour of the day accounted for which is tiring but also very rewarding." "Before working onboard the Odyssey as the Science Intern, I worked for Cape Anne Whale Watch, an organization based in Massachusetts that is affiliated with The Ocean Alliance. I feel so fortunate to have had the opportunity to experience working in such different parts of the world, with two species of whales that are totally different in so many ways." "The importance of a strong crew cannot be underestimated. A cohesive and professional team is essential to a successful expedition. We’ve recently welcomed four fantastic and experienced crew. We thought we’d give you the opportunity to hear from each of them about why they have chosen to join the ‘Voyage of the Odyssey’. "It has been 500 days since the Research Vessel Odyssey departed San Diego, California on its three-year global expedition, The Voyage of the Odyssey. Hear the reflections of some of the Odyssey crew." Sarah Sheffield plots the course of the R.V. 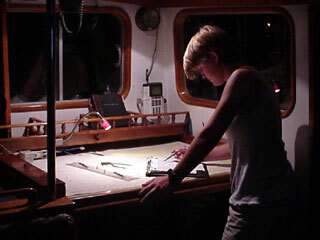 Odyssey on the chart table during her nightwatch. Josh Jones works on one of his many daily projects on the R.V. Odyssey. 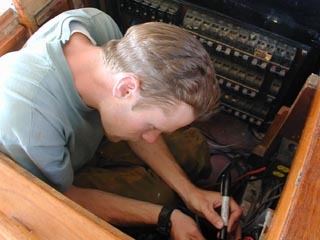 Brian Hall works on one of his many daily duties as deckhand on the Odyssey. 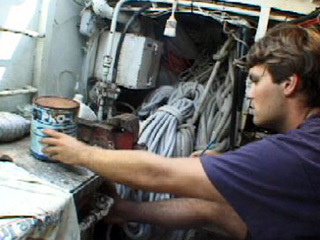 As the Odyssey experiences rough seas, even the most simple of daily tasks can become difficult. 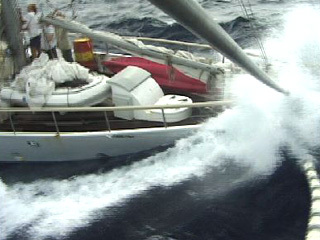 The ship may rock 40 or 50 degrees to each side, as winds pick up to 20 plus knots and waves grow to 12 feet or more.